I had intended to make this recipe with chicken feet, I used to love them when I lived in Hong Kong but have never tried them over here. I asked Paul, my Meat Man if he could save me the feet from his lovely free range roosters when he killed on Wednesday. Turns out though that free range chicken feet are far too mucky to use really, he said they were just way too nasty as his birds, despite having all that lovely space to run around in always choose to go and play in the muck heap. “Unfortunately you need feet from chickens kept inside all the time” he said, not my thing ( and my 3 ex-battery farm chickens would guilt me out too much) so he gave me a few kilos of chicken wings instead. Now the humble wing happens to be my favourite bit of the chicken. Glen always gets a very good deal when I roast the Sunday Rooster – I get the wings and a thigh and he gets the leg and breast. So many butchers just throw the wings in the bin, madness. When I worked at the butchery I saw so many beautiful plump free range wings being chucked in the bin before I could get to them, and they were beautiful Fosse Meadows chickens too, not cheap by any means! 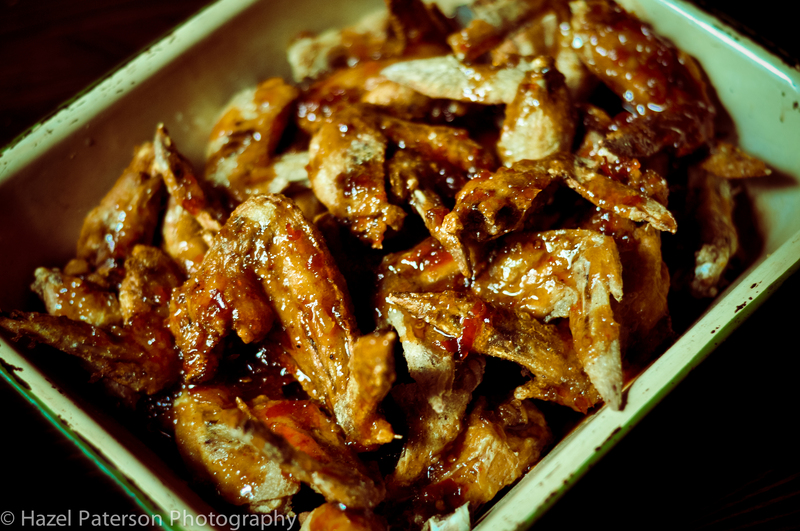 Anyway I now had several kilos of wings for the freezer so I decided to experiment a bit. I like my wings really crispy, almost burnt really, so decided to try deep frying them. I played around with trying different coatings of egg, cornmeal and flours but the best way was just plain. This way the sweet flavours of the crispy skin were allowed to shine so I settled on poaching then frying and covering in a spicy sauce. It seems like a lot of work for fried chicken but I wanted to use the same method as I would have for the feet. My wings were frozen. Put all you poaching ingredients in a big pot, add your wings and slowly bring to a simmer until just cooked through. Reserve a bit of the liquor for later. Drain the wings and plunge into a bowl of iced water. The skin will start to separate from the meat and bubble up. Drain, pat dry then arrange in a single layer on a tray and put in the fridge for an hour to dry out. Put all your sauce ingredients into a pan and heat gently, taste and add more heat or sweetness depending on what you fancy, if it seems too thick you can add some poaching liquor. Fry the wings in hot oil until crispy then drain on kitchen towel, put on your serving platter and drizzle with the sauce. They were all kinds of wonderful and best served with cold beer and plenty of kitchen towel! This looks sooo good! I’m also a real fan of the wings too and have my technique down pat for twisting and deboning it to eat almost intact – a bundle of crispy, chickeney goodness! I also love crisping up loads of chopped red chillies, ginger matchsticks, spring onions and coriander leaves (just for 1 minute with the coriander leaves going in for the final 10 seconds) and tossing the wings in this mix, with a good pinch of salt flakes. 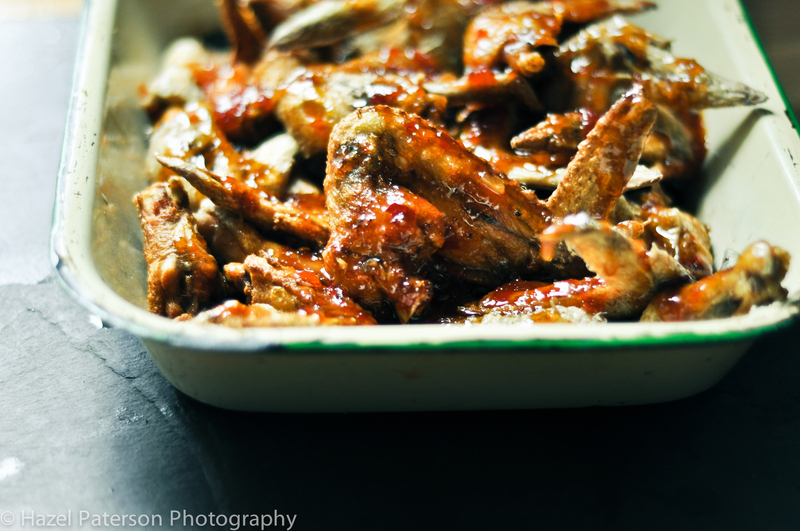 Or, for an instant fix, a good pinch of Chill salt and the herbs – both are my take on Spicy Wings with Chilli & Salt. Certainly going to try out your spicy sauce though – looks lip licking good! Mmm…Hazel my fingers are sticky just thinking about it! 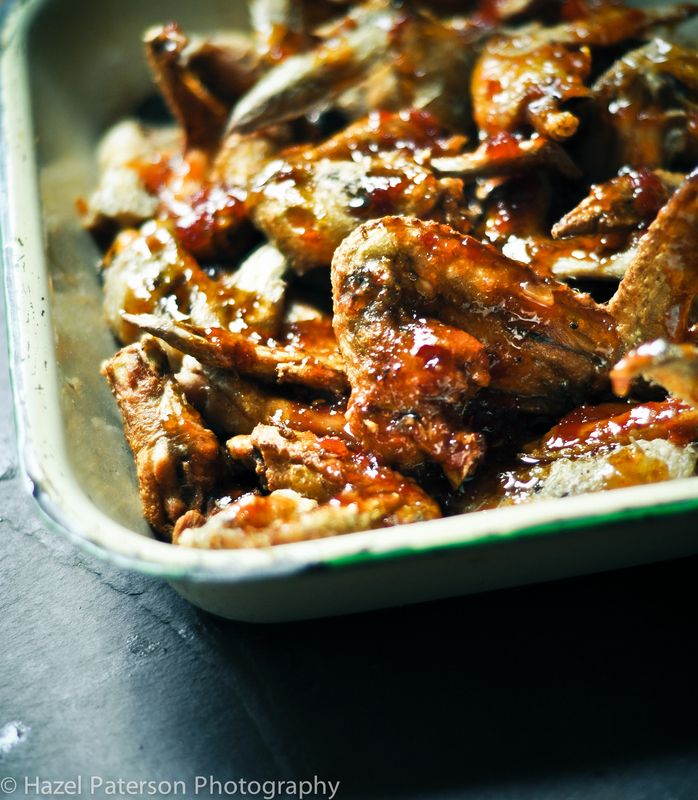 Have you tried these delicious nibbles – iIf you’re ever needing to cook the chicken skinless, then place the well seasoned skins on a wire rack over an oven tray and roast in a med/high oven until crackling-like. I’ll fight you for them! It was seriously tasty! I also use lots of coriander/spring onions when they are around but these sauces are always in my fridge so its a fantastic base to add fresh ingredients to depending on whats in season. Not the healthiest of suppers but so worth it!